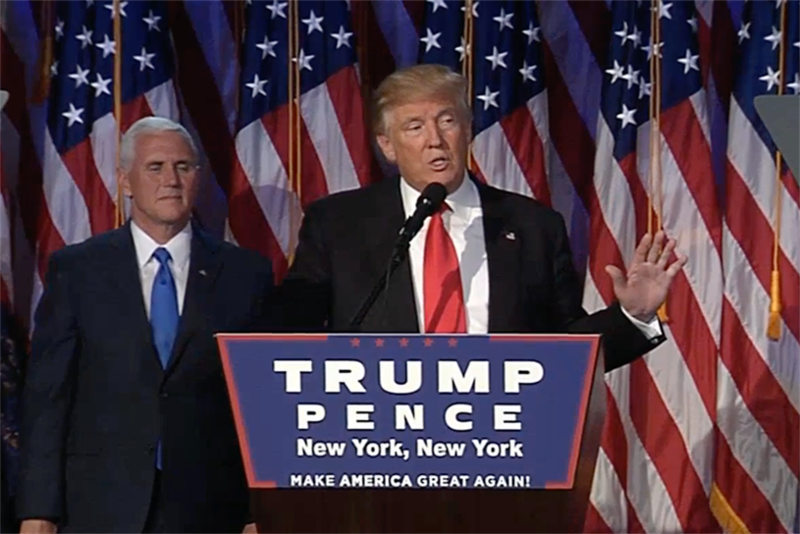 As Americans were waking up to learn that Donald Trump had won the presidency in a stunning upset, advertising and media investors in Europe were reacting with caution. Initial reaction on the London stock market to the political earthquake in America shows investors do not believe there will be a significant impact on global advertising spend. In early trading the share price of WPP, the world's largest advertising group, is no more volatile than usual, falling just 1.6% to $21.12 as of 9 a.m. UK time. It was a similar picture at French groups Publicis, down 1.6% to $65.98, and Havas, which is unchanged at $7.96. Media giant Vivendi is also less than 0.5% down, while ITV is actually up by 0.8% to $2.08. The exception is Japanese advertising group Dentsu, which fell 4.9%, in line with the Tokyo stock market, by the close of trading in Asia before Hillary Clinton conceded the election. In London, at least one agency responded with a note of mournful optimism: Creature shut its doors an hour early and encouraged its employees to use the time to "do some good." In a Facebook post, the agency said it is encouraging staff to leave work an hour early to "do some good." The post said: "Well. What a day. In a world where kindness and tolerance feel slightly lacking at the moment, we're going to try to do a little bit to redress the balance." The agency recommends donating money to a charity, giving food to a food bank or calling parents and grandparents. "It's not a lot, but we're feeling as helpless as the rest of you at the moment, and we want to be able to look back on today as a day when we did our bit to make a pretty battered world feel a little kinder," the post said. "We want to leave today better than we found it." What is professionalism when business is not usual?